A new The Real Giveaway is running online these days. 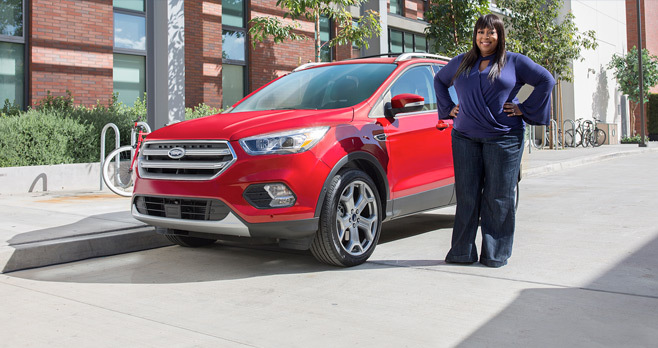 Enter the The Real Friend Ford Escape Giveaway for your chance to win a brand new 2017 Ford Escape plus a trip in Los Angeles, CA for the opportunity to make an appearance on The Real. To participate, simply tell The Real why you’re nominating a deserving friend at thereal.com/therealfordescapegiveaway for a chance to win a brand new Ford vehicle. The Contest is open to legal residents who are physically residing in one of the 50 United States (but excluding the territory of Puerto Rico) or the District of Columbia who are physically residing there. All entrants must be at least 18 years old (or the age of majority of their state/province of residence) as of the date of entry. The Sweepstakes Period begins at 9 a.m. EDT on Monday, July 31, 2017 and ends at 11:59 p.m. EDT on Friday, September 1, 2017. No more than one entry per person/e-mail address will be accepted during the entire Entry Period. Total ARV of the Prize is $23,760 plus taxes. Winner will be selected on or around September 8, 2017. For name of the Prize winner, go to Thereal.com/TheRealFordEscapeGiveaway after September 23, 2017. This Sweepstakes is sponsored by AFN Productions, Inc. 3500 West Olive Avenue, 10th Floor Burbank, CA 91505. For complete details, including Official Rules, visit thereal.com/TheRealFordEscapeGiveaway. Recently, I tried to enter the contest: https://thereal.com/page/2017/07/19/nominate-your-bestie-for-the-chance-to-win-a-brand-new-ford-escape/. As per the official rules, there is a requirement for: “A written statement of no more than 500 words explaining why Contestant deserves a chance to win a brand new 2017 Ford Escape (the “Statement”).” I wrote a statement of exactly 500 words. However, when I tried to submit it, I got the following error: “Please limit your story to 1500 characters or less.” I then modified it to be exactly 1500 characters, and although it wasn’t nearly as good as the 500 word one, I tried to submit it again, but I got the same error. I then tried to enter again, this time, using a different browser, but I still get the same error. I am not sure as to what to do next. Can you help? Thanks very much in advance.